Sam Allardyce would feel let down if the Football Association appointed a foreign manager to succeed England boss Sven-Goran Eriksson. 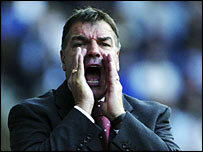 Bolton manager Allardyce told The Sunday Mirror: "I would feel betrayed if the FA chose a foreign manager. "Sven was the right man at the time, but the job must go to an Englishman." Allardyce is sure he is the man for the job: "I don't think there is another manager in this country who has achieved as much as I have." Allardyce added: "That might sound big-headed to others but, if you compare the money we have all spent on players and wages, pound for pound my record's as good as anyone's. "If you had a league table based on money spent and the relative success achieved, I'd think Bolton would be top of it every year. "Chelsea have spent £270m. If I had spent that amount I'd guarantee winning the title every year. That would be the minimum requirement. "Certainly if I finish in a Champions League spot this season then I'd like to think that would strengthen my chances of becoming England manager."